To say that Balla Kouyaté was born into a musical family is an understatement. His family lineage goes back over 800 years to Balla Faséké, the first of an unbroken line of Djelis, or griots, in the Kouyaté clan. This family is regarded as the original praise-singers of the Malinké people, one of the ethnic groups found across much of West Africa. Djelis are the oral historians, musicians and performers who keep alive and celebrate the history of the Mandé people of Mali, Guinea, and other West African countries. Balla Kouyaté is a virtuoso player of the balafon, the ancient West African ancestor of the xylophone. Played with mallets, the balaphon is made up of wood slats of varying lengths. Underneath, two rows of calabash gourds serve as natural amplifiers. 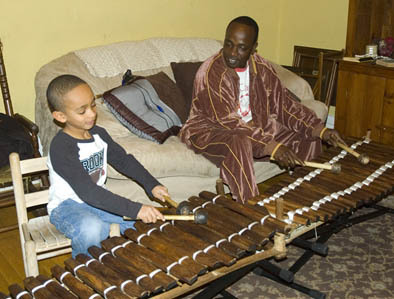 Balla learned to play the balafon from his father in Mali. This being a hereditary tradition, Balla will teach this Djeli music to his son Sekou, so that he may also accompany Djeli singers who share the history of their West African ancestors. Sekou has demonstrated a natural gift for music and rhythm and Balla is eager to teach him more formally. In addition to working on technical skills in accompanying six songs from the Djeli repertoire, Sekou will learn the story behind these songs. Father and son also plan to travel to several Malian ceremonies in New York, as well as to Balla's home village in Niagassola for the annual ceremonial playing of the sacred balafon.